Lucerne is one of the most popular tourist destinations in Switzerland – and that is for a reason. The city itself is beautiful and the scenery is some of the most stunning in the entire country. 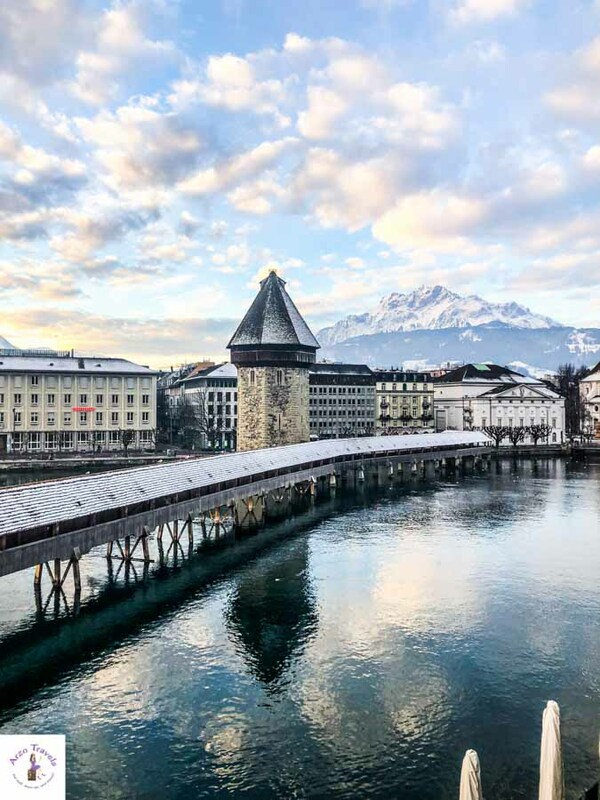 Since accommodations in Switzerland, and especially in Lucerne, are extremely expensive (Lucerne is one of the most expensive places in Europe), you cannot expect super bargains, but there are accommodations for every budget. 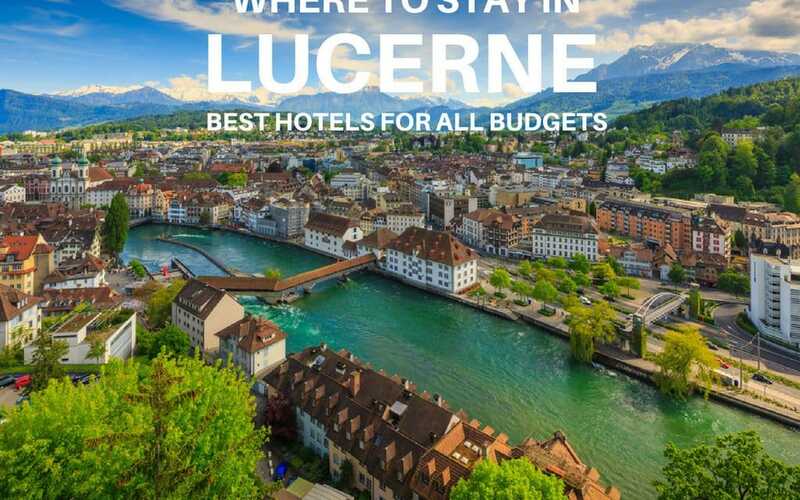 If you are looking for the best places to stay in Lucerne, you are about to find out what the best areas are (do not just stick to the city center) and the best choices for all price ranges. This post will help you find the best places to stay in Lucerne (including information about the distance to main tourist attractions) and what to know when booking accommodations there. Lucerne is one of the biggest cities in Switzerland, located in the region between Zurich and Interlaken. Lucerne is in the German-speaking part of the country (there are four official languages in Switzerland, but German is spoken by most), but you will have no issues getting around with English, too. This area is extremely popular among tourists, so do not be surprised if you see visitors in large numbers, regardless of the time of year. Actually, it often feels like Lucerne only has tourists from around the world, which probably makes accommodations even more expensive. The Wooden Bridge is probably one of the most popular and famous tourist spots in Lucerne, but it also has a lovely old town, the famous Lion Monument, and of course, the stunning Lake Lucerne. However, there is much more to see in Lucerne. 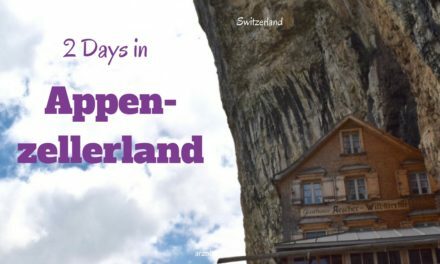 If you book your stay, you should know about the beautiful mountains, Mount Rigi and Mount Pilatus, which are fantastic areas to stay in Lucerne. 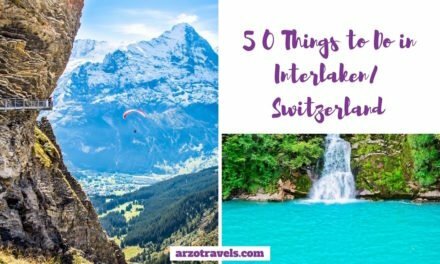 If you are wondering about the best activities in Lucerne, head to my post about the best things to do in Lucerne afterward and here are my tips for the best places to visit in Switzerland. From luxury hotels to hostels – here are some great places to stay in Lucerne, Switzerland. Here are the best luxury hotels in Lucerne. This interesting, 5-star hotel is the perfect choice for all who enjoy a luxury hotel that is centrally located. While it is one of the classiest hotels in Lucerne, the atmosphere is not stiff. This is probably because it is also a festival hotel and they host smaller concerts and events. You´ll notice many small artistic details – from a music quote on the wall to little music notes on the doors to the fact that every room has hosted one famous musician or another. More little details, along with having their own newspaper, make this place even more unique. 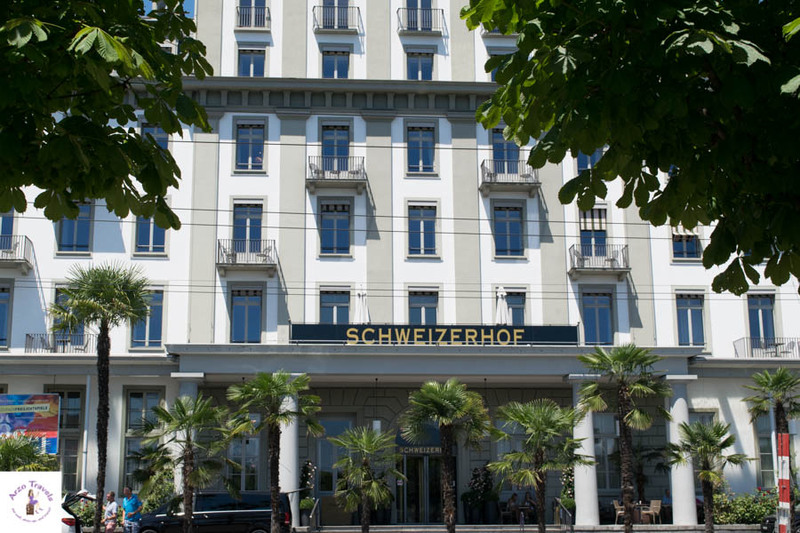 Whether you book a double room or a suite, you cannot go wrong with booking a room at Schweizerhof Lucerne. Tip: If you have the chance to book a room with a lake view, pay the extra CHF and enjoy nice views of this stunning lake. 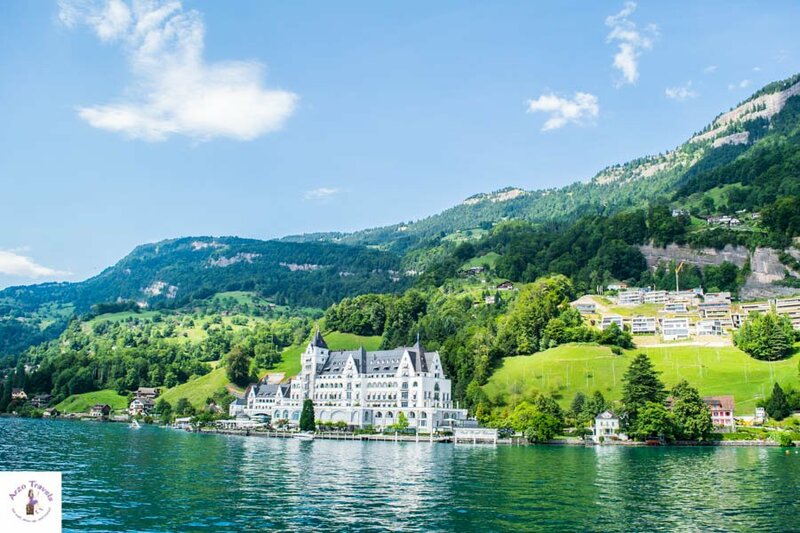 Vitznau, located on the shores of Lake Lucerne, is home to a luxury hotel par excellence. You can get to Vitznau easily by boat, or by car (it takes about 35 minutes, and the drive is along one of the most beautiful roads in Switzerland). Getting there by bus or tram takes a bit longer, but it is totally worth it. The region of Vitznau is well-known for being all about relaxing – and so is this hotel, probably the most expensive one in the region. The hotel looks quite impressive when approaching via boat. When you are standing in front of it, it looks a bit sterile at the entrance, but this place definitely knows how to impress. You can expect pure luxury. It does not matter which of the 47 suites you book, all are designed uniquely. You always have non-alcoholic drinks available at the pool, unlimited spa access, daily newspapers, and more services offered. Unfortunately, no pets are allowed – not even in the outdoor cafe. Here are the best mid-range hotels in Lucerne. This beautiful hotel can be spotted from Lucerne´s most famous tourist attraction. 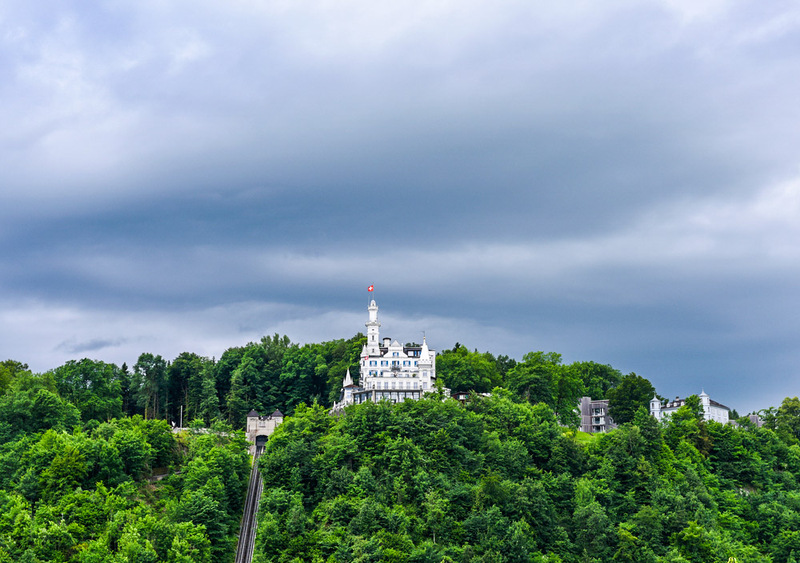 Standing on the Chapel Bridge, the hotel is visible and can be seen standing proud on the mountains. It has become an iconic place to stay in Lucerne. This 4-star hotel offers one of the best views of Lake Lucerne. Whether you enjoy the views from one of the rooms or from the terrace, where you can also dine and drink; on a clear day, these views are priceless. Each room has a unique design (hurry up with booking, as this boutique hotel only has 27 rooms) and most come with a lake view – all come with a luxurious marble bathroom. You´ll have a wonderful, relaxing time with views and services like this. Another 4-star hotel with a great location is this property. It is centrally located, just a stone’s throw from the main train station and Chapel Bridge. 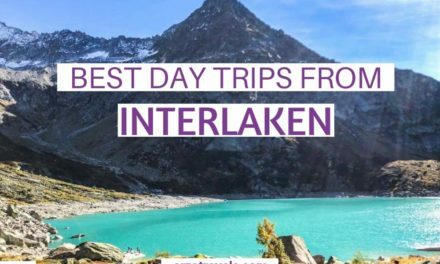 Its wonderful location makes it easy to get around and discover a lot of Lucerne on foot. The hotel also emphasizes its commitment to sustainability. So if you want to stay in a central location in Lucerne and also help support different causes – like the Swiss Red Cross or by using light bulbs that help save energy – this hotel is the perfect green hotel for you. The hotel does not have its own fitness facility but offers a discount for the wellness and fitness facilities close by. You have the option to choose from five different room types – all rooms have been newly refurbished. During my last trip (Januray 2019) I stayed at the Hotel des Alpes – just next to the Chapel Bridge. The location is perfect and if you choose a view of the river you have a beautiful view of the Reuss River, stunning Mount Pilatus, and the Alps. The city views offer views of the old town – so, I recommend to pay a little extra to have great views. However, it is not only about the views. The hotel is a good 3-star hotel: modern, clean and with a decent breakfast. The restaurant downstairs offers breakfast (with a view) and from there you are ready to explore the city within minutes. So, personally, I think, there is no better 3-star hotel with a better location in Lucerne than this hotel. Click here to find the best rates for your stay at Hotel des Alpes. Have not found the perfect hotel in Lucerne for your stay yet? Okay, here are some more tips for the best Lucerne accommodations. This property is actually for guests who like to hold seminars and stay overnight, but other guests can stay here, too. The hotel offers the best value for the money. It only takes 10 minutes to get to Chapel Street, and a few more minutes to arrive at the train station. The bus station is around the corner, which makes it easy to get around (as with all the hotels directly in Lucerne, you get a ticket for public transportation during the time of your stay). The hotel is very basic and located in a quiet and peaceful area. It does not offer any luxury, but it is absolutely clean and has everything you need. For the cheapest option, you can book a private or double room with a shared bathroom or a private room with a bathroom in it. It is definitely a good choice and a better one than some hostels. You will not get more value for this price in pricey Lucerne. If you do not have breakfast included in your hotel booking, you can just book breakfast when checking in. While choices are limited, the price is good at less than 8 Euros. This bed-and-breakfast offers single and double rooms (with an occupancy of 4 people maximum). Some rooms have a shared bathroom, and some have a private one. The rooms are very basic, but the pricier ones actually have their own balcony and TV, and some have their own kitchen. It is also located in central Lucerne, which makes it easy to get around on foot or by public transportation. This hostel is located close to Kriens, not too far from the old town of Lucerne and perfect if you plan a trip to the fabulous Mount Pilatus cable car station. You´ll find some restaurants and cafes nearby and you can catch a bus directly to the train station. Though the prices are much cheaper than those in hotel rooms, you still get the ticket to use public transportation for free. While, as mentioned, rates are comparably low, you have to pay around 30€ for a bed in a mixed 6-bed dormitory. A bit more expensive, though not much more, is a bed in a 4-bed dormitory (females or males), or a 3-person dormitory/family room. If you prefer an ensuite bathroom, you can book a 2-person double-room, too. 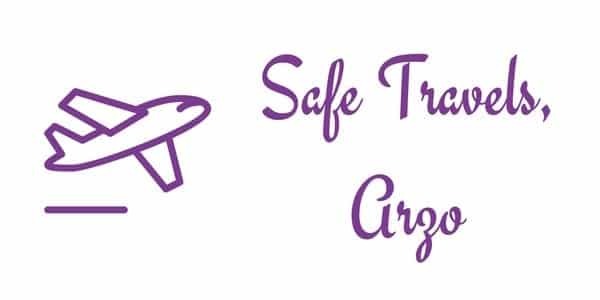 Some perks: You can use the kitchen, and there is free coffee and tea, an Asian-style breakfast, free parking, personal lockers in each shared room, and all linens are included. 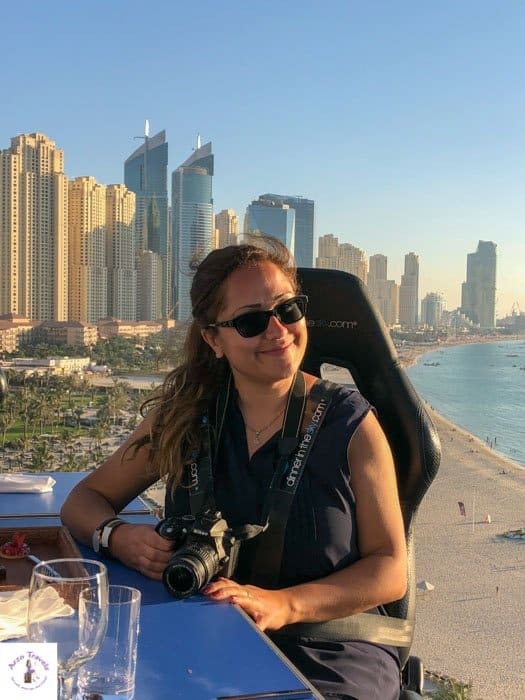 I hope, this post has helped you to find the perfect accommodation for your new Lucerne trip and you have a wonderful time in beautiful Lucerne, Switzerland.